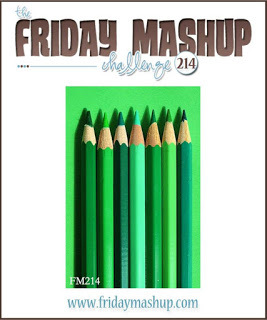 This week at The Friday Mashup Heidi is our hostess and she'd like us to use stencils on our projects along with a monochromatic theme. I love earthy, darker colors so I decided to go with shades of brown. I started with a Crumb Cake base and used some stencil that I won a few years ago, I don't have it handy at the moment to see who makes it. I used Early Espresso to sponge the dots, doing some light and some dark. The strip down the side of the card base is some retired Early Espresso DSP. I stamped the image from the Serene Silhouettes set in Early Espresso on Crumb Cake, cut it out with Oval Framelits and then popped it up with dimensionals. The sentiment is also stamped in Early Espresso on Crumb Cake and I made that into a little banner across the bottom of the oval. The layout is a recent one from Freshly Made Sketches. Head over to The Friday Mashup blog to see what the rest of the DT did and then play along with us! Create a project with "stencils"
Create a project with "a monochromatic theme"
or Mash it Up! and Create a project with " stencils and a monochromatic theme"